After Senator Elizabeth Warren's speech, SPA dean Vicky Wilkins moderated a Q&A session with students. 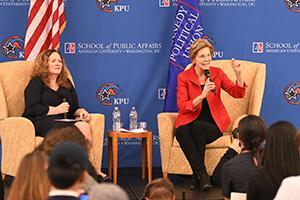 Senator Elizabeth Warren, D-Mass., gave a major foreign policy address at American University Washington College of Law. In a rousing speech before a rapt AU audience, Warren called for strengthening democracy at home and abroad, while pushing for a global trade policy that supports workers. AUWCL is a fitting venue for Warren, who launched her policy-centric—and eventually political—career as a law professor. As a tenured Harvard professor and bankruptcy law expert, she engaged in national debates over financial reform and was a leading voice for consumer protection. In 2012, she became the first woman ever elected to the US Senate from Massachusetts. She developed an even broader policy platform, and on Thursday afternoon, she focused on the United States' role in the world. The event was presented by AUSG Kennedy Political Union and cosponsored by the School of Public Affairs and AU College Democrats. SPA dean Vicky Wilkins moderated the discussion and Q&A with students, and AUWCL associate dean Brenda V. Smith introduced Senator Warren. Here are 10 memorable moments from Warren's campus appearance. Warren said democracy is under assault globally, but this wasn't always the case. "There's a story that we as Americans tell ourselves about how we built an international order—one based on democracy, on human rights, and on improving economic standards for everyone. It wasn't perfect. We weren't perfect. But our foreign policy benefited a lot of people around the world." She said the US is now in crisis, and she connected that to inequality, a hollowed out middle class, and unsustainable military entanglements. "We need to end the fiction that our domestic and our foreign policies are somehow separate from each other, and recognize that policies that undermine working families in this country also erode America's strength in the world. She argued that US trade policy often hurts American workers and unions. "For decades, leaders of both parties preached the gospel that free trade was a rising tide that would lift all boats. It’s great rhetoric. Except that the trade deals that they negotiated mainly lifted the yachts, and they threw millions of working Americans overboard to drown. Warren blamed US economic policies for stagnant incomes and weaker labor standards. "By the time the 2008 global financial crash came around, it only confirmed what millions of Americans already knew: The system didn't work for working people, and it wasn't really intended to. She recommended an honest cost assessment of US military commitments. "All three of my brothers served in the military. I know that our servicemembers and their families are smart and tough and resourceful. But a strong military should act as a deterrent, so that most of the time we won’t have to use it." Warren called for bringing US troops home from Afghanistan immediately. "On my trip to Afghanistan last year, I met American servicemembers who were young children on 9/11. This isn’t working." She talked about emerging threats from Russia and China. "Both are working to undermine the basic human rights we hold dear. If we cannot make our government work for all Americans, then China and Russia will almost certainly succeed at their goals," she said. "But here’s the thing about authoritarian governments: They are rotten from the inside out." In response to a student question about climate change, she sounded a dire warning—with some humor. "I'm here at a university. I feel more relaxed. Things I can say here that are very controversial on Capitol Hill. I'm just going to throw one of them out: I believe in science," she said to huge applause. "Climate change is real, and the urgency of the moment cannot be overstated. The United States is a leader in climate policy. It's just leading in the wrong direction right now." She knows her AU history! "Fifty-five years ago, when President John F. Kennedy spoke right here at American University, he said that, 'Our problems are man-made, and therefore, they can be solved by man.' The same is true today. OK, I'd add they can be solved by women as well," Warren noted. The senator also gave students a reason for hope. "I believe in us. I believe in what we can do. I believe in democracy, and I believe in what we must do to save it." In an interview afterwards, KPU Director Yazan Hanouneh explained the genesis of Warren's appearance. "Unlike most of our events, they actually reached out to us," he said. "Her staff indicated that Senator Warren enjoyed speaking here so much two years ago, they wanted to bring her back to talk about foreign policy." Hanouneh added, "We're just really happy that KPU could be a part of this fantastic event, and that the senator was here at American University." Olan Trosky, CLEG major and the communications director for AU College Democrats, had high praise for Warren's speech. "I was always a huge fan. So, it was really cool for me personally, and I actually got to meet her," she said. "And I thought she brought up a lot of really interesting topics—big topics that we'll see come up in 2020." Warren was mum on her presidential aspirations, but that didn't stop the audience from playing Washington’s favorite parlor game. Trosky's guess? "She's running." Read more about student reactions to Warren's appearance, and visit SPA's Twitter feed for additional photos and memorable moments.